There is no more beautiful view of the Kennebec Valley in Hallowell than from Powder House Hill. Prior to colonization, Native Americans of the Wabanaki tribe along the Kennebec River named the Hallowell area Bombahook. The first colonial settlement was established in 1762 and Hallowell grew and prospered. The town was named in honor of Benjamin Hallowell, a wealthy Boston merchant and one of the Kennebec Proprietors, holders of land originally granted to the Plymouth Company by the British monarchy in the 1620s. By 1771, more settlers had arrived and Hallowell was incorporated. A small militia was formed January 1775. Maine men got involved in the Revolutionary War. The inhabitants chose a location above the city and along the ridge on High Street. This plot of land, known as Couch’s Ledge, had been previously owned by John Couch, a Revolutionary War veteran. By June of 1820, the powder house had been constructed and Ebenezer T. Warren, an eminent citizen of that time, conveyed the property it stood on to inhabitants of Hallowell. 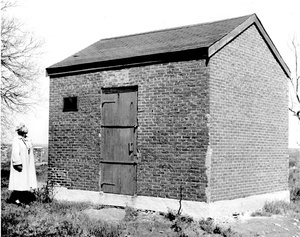 In December 1947, the city of Hallowell gifted the powder house to the Mary Kelton Dummer Chapter of the Daughters of the American Revolution. The powder house was entered in the National Register of Historic Places on April 11, 2002. The Daughters of the American Revolution group oversees the care of this historic brick building with its one door barred with iron and once monogrammed and initialed by visitors of the century. In 2003, this significant artifact was restored with a new roof and door, paint and trim and masonry work. A decorative bronze plaque was placed on the exterior of the building for identification and information. New plants and a concrete settee have been added at the location. In addition, the restored historic cannon known as the Old Thunder Jug is back in its original site beside the powder house. Many town folks and visitors stop by frequently to view this well known Hallowell landmark and sight and see the Kennebec Valley below. As native born in Hallowell and raised in the house my dad built on the same street 250 feet south of the powder house, I can attest to the uniqueness of this spot. As a youngster, I spent many hours with my friends of the grounds surrounding the powder house. We climbed over the ledges, played house, school or cops and robbers there. Hide and seek, red-light and Simon says were familiar games we also enjoyed. On hot summer days we would pack picnic lunches and escape to the ledges, where we could feel the cool breezes blow up from the valley below. In spring, we watched the wild scarlet columbine unfold and picked fragrant mayflowers and various other flora on this spot. Cold winter snow days would entice us outside with our sleds, where we would climb up to the powder house and slide down High Street, which in the 1930s was just a narrow dirt road and seldom traveled across by car. We played, grew and thrived being part of Hallowell history on Powder House Hill. Today I cherish living as a neighbor conveniently located between my childhood home and the familiar powder house. It provides me many happy and sentimental memories of my youth. Now as the years pass, I spend hours outside in my flower gardens beside the powder house and think how lucky I was to grow up in Hallowell and still be a citizen here. Grace Maxwell looks at Hallowell’s powder house.